Are you like me? You know, you have boxes and boxes of Christmas decor that you don’t so much love anymore but you can just throw it away because what if you need it again one day? Yes. I’m a borderline hoarder. But I feel vindicated because this super cute DIY yarn wrapped ornament cost me absolutely no money to make and was the perfect touch for my Christmas tree. They offer the perfect touch of texture to a tree otherwise filled with glitz and bling! I made my ornaments with things I hoarded had on hand. I used some old plastic ornaments and some fuzzy/chunky yarn I bought years ago and never used. I think your result will be better if you use a thicker, fuzzier yarn rather than a more tightly woven one. Begin by adding a dot of hot glue right at the top of your ornament and once it sets start wrapping the ornament, changing directions every so often to add interest. I was making these in my craft room upstairs and bringing them down to hang on the tree and my 6 year old son asked if he could help. I showed him how and he actually made the rest (I did the hot glue portion for him!) So you know they are easy if my 2nd grader can whip them out! 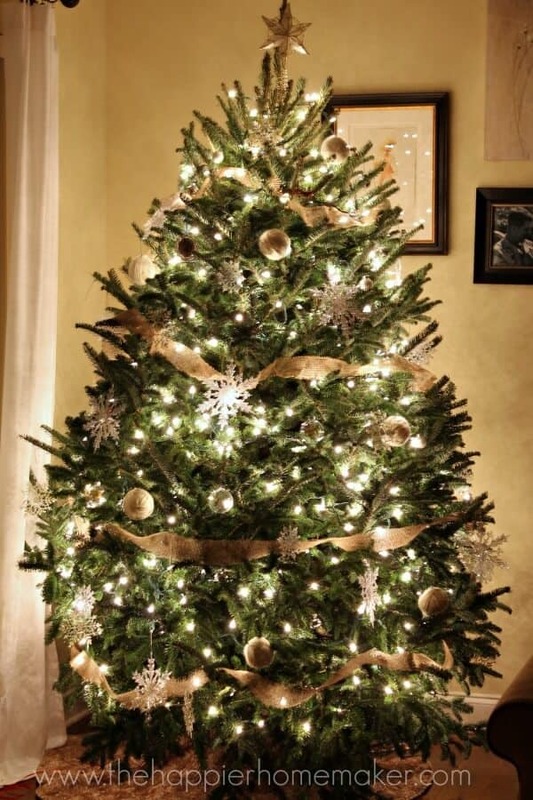 I love the simplicity of this project but the soft texture it adds to your tree! I’ll definitely be making some of these fo our tree! More delightful neutralness! I love it! Court, you know I’m delightfully neutral myself, what else could my projects be? I posted a DIY ornament up-cycle today too. I love how yours came out!